It was well worth the wait. My brother Alan and I finally took Terra Nova out for a run two weekends ago and it was wonderful to be back out on the water. 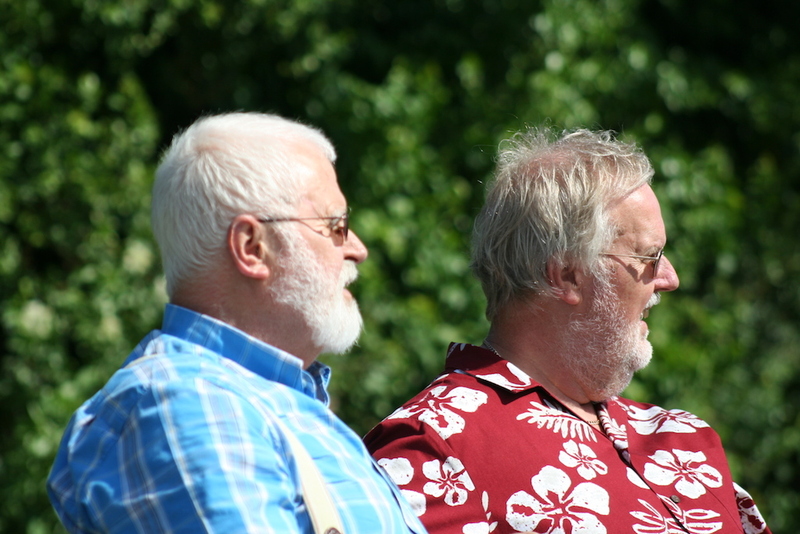 Double trouble: Alan, left, and Mort Smith. My brother Alan and I finally took Terra Nova out for a run two weekends ago and it was wonderful to be back out on the water. I didn’t realise just how much I’d missed it until we pulled away from the quay at Bridge Marine and headed up towards Desborough Island. We weren’t in a rush. We fell behind a slow-moving narrowboat and just pottered up towards the Walton Marine buildings and along past Lady Lindsay’s lawn and Desborough Sailing Club. It was obviously meant to be because with the sun shining and the wind gently wafting past us, we overtook a Cornish Shrimper sailing boat with its mast neatly stacked along the cabin top. I’ve always coveted one of those pretty little sailing cruisers produced by the Cornish Crabber company down in the West Country. They sail beautifully, with a lifting keel and a gaff rig so that you can explore the shallowest of creeks and sit upright on the bottom if the tide leaves you. I used to want a Cornish Crabber 30 — the big brother of the Shrimper — but when I first discovered the marque, it was back in the late 1980s and the 30ft version was selling for around £30,000 if my memory serves me right. Now, nearly 30 years on, the price has soared to over £100,000 and there’s no way I can afford that so I’ve set my sights a good bit lower on the 20ft two-berth boat. Even that — new — will set you back several tens of thousands, but on the second-hand market you might pick up a half-decent boat for £15,000-£20,000. I must admit that I’d always thought about buying one on a trailer so that we could tow it down to the coast or up to the Lake District. Toasting the Terra Nova: Mort Smith, where he loves to be. The idea of sailing it on our part of the Thames hadn’t really occurred to me but seeing this one heading into a mooring at Desborough got me thinking that it might not be such a bad idea. 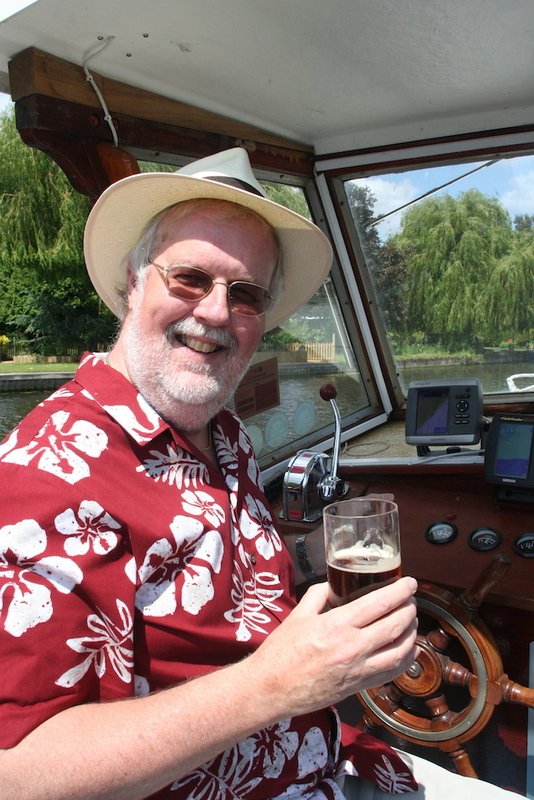 We motored up to Shepperton Lock and then through it with three or four other boats (which was also nice — the river wasn’t too crowded which made for a stress-free day). We made a turn and came back to moor up outside the Thames Court Hotel and just sat in the cockpit eating a picnic and raising a glass to each other. It’s wonderful. My brother and I don’t see each other for weeks at a time but when we get back together aboard the old boat, it’s as though we’ve never been apart. I love listening to his tales of life on the river when he was a youngster — he’s 10 years older than I am. He used to live aboard an ex-RAF air sea rescue launch (number 2744) that was moored at a boatyard, the name of which escapes me, just downstream from Richmond Half Lock. It was one of the first places he’d lived away from home and I used to go down there regularly to see him and the mates he shared the boat with. There was also his absolutely stupid little mutt called Toby who used to run around and round the deck before falling in and having to be hoicked out, dripping wet and covered with mud. You’d need to rinse the mud off him, dry him off and set him back on the deck and blow me if he wouldn’t jump straight back in. Not too tightly wrapped was Toby. It was a lovely day and we didn’t get back to Bridge Marine until late in the afternoon. The old boat seemed to appreciate the exercise and I’m sure Bruv and I did. There isn’t a better antidote to life and work stress than messing about on a boat with a good friend.